Are you JUST A SURGICAL TECH? If you're in a position in your professional life where you feel like you're: "JUST A SURGICAL TECH"....., PLEASE, just give me a few minutes of your time to read how you can change things around, INSTANTLY! As many of you know, I talk to surgical techs on all levels on a regular basis. Now when I say all levels, I'm referring to surgical techs who are working full time as a scrub, surgical techs who are educators, surgical techs who are professional sales reps in & around the O.R., surgical techs who are travelers, surgical techs who are in nursing school or FA school, and just about every other level of surgical techs that you can possibly think of. Listen up for one moment here, please! If you're a surgical tech student, new grad, seasoned veteran, loving your job, hating your job, and/or moving up the surgical tech career ladder, we all know it's not easy. HOWEVER, if you think you are: "only..." or "Just a...", then you are setting yourself up for failure! 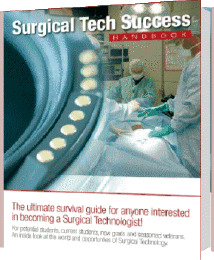 Many of you know my background and are well aware that I've been in & around the surgical tech world for decades. I mean I'm talking about 20+ years of blood, sweat & tears learning my craft and the dynamics of surgical technology & the operating room, and applying everything I've learned since surgical tech school to put myself in a very successful position in the world of surgery. Now I'm not trying to sound arrogant but if I can take a surgical tech education from the 1980's and grow myself into a professional & lucrative position based on a surgical tech education & experience, then you can too!!! For most people it's a matter of how you view yourself. For others it's a matter of what you think others are thinking about you. That might sound crazy but you'd be surprised at how many people view themselves as "only a..." or "Just a...." because of what they think others are thinking. Now I'm no psychiatrist but I've been exposed to enough personalities in & around the surgical world in my lifetime to know people pretty well. And for most, you are your own worst enemy! Trust me because I too was once my own worst enemy and felt as though I didn't deserve to be successful. Yep, there was a time in my surgical career when I had a hard time being "Just a surgical tech.."
I mean, that's exactly how I viewed myself and that's exactly how I felt. But throughout my experiences in the surgical world, I came to realize how specialized, technical, and valuable the skills of a good surgical tech can become. However, the first step is realizing that you are NOT: "Just a...."
Listen, just to keep things real here, I know for a fact there is a good percentage of surgical techs who will always view there position as: "Just a..."
And these are the individuals who will be miserable getting up every day for work going to the O.R. dreading the case assignments, looking for that first break, counting the minutes to lunch time, sitting around the lounge talking about everyone else, and then making a big stink if they are not relieved exactly at the end of the shift. I know because there was a time when I was that person & a large percentage of my co-worker scrub techs were too. Therefore I took the long road early in my surgical tech career and learned the hard way. AND the reason I'm telling you all of this is because you can take a short cut by learning from & hopefully avoiding my mistakes. Today, I LOVE working in and around the O.R. as an educator for surgeons, scrubs, & the entire O.R. team when I'm covering a case. I love being the "go-to" man when they are using the device I represent in surgery. I'm the educator in the room high-fiving the O.R. team when I help a scrub tech and a surgeon successfully use a product. Today, I love being the contact person for surgical techs who want to become first assistants. I'm the educator on the phone motivating surgical techs who are thinking about becoming a first assistant & looking for the opportunities of advancing their career. Today, I love encouraging potential surgical tech students to follow their dreams & professional passions. I'm the educator who gets all warm & fuzzy when I get a thank you email from a surgical tech grad telling me that I helped motivate them into this field and its the best thing they've ever done. Yep, I'm the educator who does what he does with passion because I enjoy seeing others succeed. And above all I'm the educator who is telling you that you are not "JUST a....."
I'm the educator who is telling you that if I can do it YOU CAN DO IT TOO!!!! What's stopping you from being more than "Just a..."
To be successful in & around the O.R. you have got to look for the opportunities. If you're content working as a scrub tech for the rest of your professional career, MORE POWER TO YOU!!! Seriously, do it with the passion of an all time surgical tech champion. Be the scrub who the doc's request on their cases. If you're not content working as a scrub tech for the rest of your professional career, utilize the back door access you have in surgery, look around, and decide upon another route. If you see an opportunity, a need to fill, or a way to make something better in or around the O.R., why not come up with a solution and market that solution. The only limit you have is what you limit yourself to think of. Early in my career I never thought I'd make any money or do much on a professional level in or around the surgical world. Early in my career I got exactly what I thought about. But once I started to want more on a professional level, I started to learn more. I'd carry my Alexander's to work every day and read up on the cases I was assigned to prior to starting the day. I'd look at the assignments for the next day if possible, go home and do a little more studying from my Alexander's. The point is, I applied myself to learning more and it started to show in my performance. As my scrub knowledge grew, me performance grew. As my surgical tech performance grew, the more valuable of an O.R. team member I became. The more valuable I made myself in surgery, the more marketable I became. The more marketable I became, the more I started to create my own professional path. Again, if I can do it, You Can TOO!!! What's stopping you from being more than: "Just a..."
Please enlighten me, good or bad, lets hear it!